Silk, silk thread, silver-gilt thread; hand-woven brocading, hand-sewn. 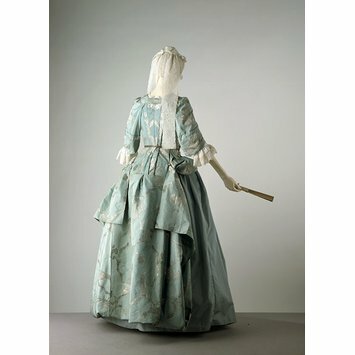 By the early 18th century, the mantua was worn by women as formal day wear. 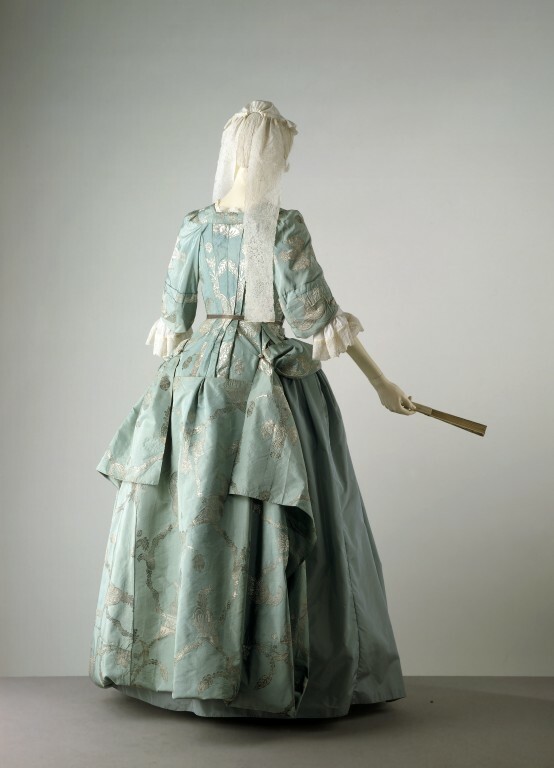 The pale blue silk of this example is brocaded in silver in a large-scale pattern of fantastic fruits and leaves, a typical design for the 1720s. The train of the gown is folded up and the sides held back with a loop and button. This complicated draping required a reversal of the silk when sewn together, so that only the right side of the fabric would show when properly arranged. A woman's mantua of blue silk, brocaded with silver-gilt thread in a pattern of scrolls and foliage arranged in large diamond shapes. It is open down the front with robings. The sleeves are elbow-length, with three tucks at the bottoms and gathered at the top. At the sides of the train, the fabric is reversed (sewn wrong side to right side) to allow it to be pulled up and turned over at the back when worn. There is a covered, silver button at the centre back hip. One silver cord loop remains on the right, but is detached and missing on the left. The fronts are faced in pink silk, probably a later addition. There are two very large, round, heavy lead weights in each sleeve; one is covered in white silk and one with pink silk both also added later.